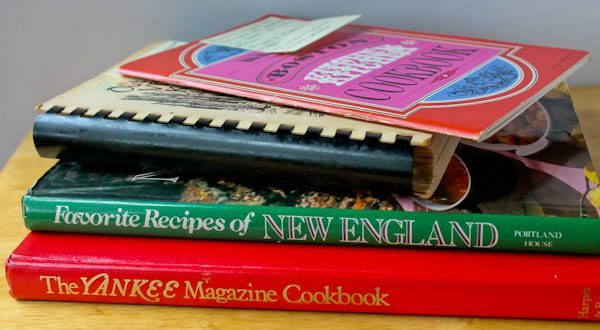 The 44th Pillsbury Bake-Off in Orlando, Florida is where I first met Jannine Fisk of Malden, Massachusetts. My daughter Kristina and I were enjoying our breakfast at one of the huge tables in a Bake-Off ballroom. Someone walked up behind Kristina and gently tapped her on the shoulder. “Hi Kristina! Hi Debbie,” she said. “I’m Jannine Fisk and so happy to finally meet you both!” Jannine said she was a member of Cooking Contest Central which Kristina owns and runs, and she wanted to meet the person behind the company. Jannine has a smile that lights up a room and we had a nice conversation with this lovely woman. We watched her as she continued to circle the room introducing herself to everyone. We could see the excitement dancing around in her eyes to be competing in her first Bake-Off, a feeling Kristina and I both shared in previous Bake-Off contests. We knew right away our fingers would be crossed for Jannine, and she also stole the hearts of many people in the room with her enthusiasm and sweet disposition. When I returned home, I wrote a blog about the Bake-Off and knew I wanted Jannine to be a part of it. You can read all about Jannine’s experience in her own words here. In the end, Jannine did not win for her “Bourbon Street Muffuletta Braid” (doesn’t that sound good?) but her talent for baking led to her eventually opening a successful bakery with her sister after the Bake-Off. So here we have a baker extraordinaire and savvy business owner with many admirers of her talents. Little did Jannine know that life would take an unexpected turn that would test her to her very core. Jannine was recently diagnosed with a brain tumor and facing chemotherapy and radiation. All those who knew and loved Jannine were devastated for her, but we also knew deep down that she would get through it. And she did. Jannine made it through it all and will be going back to work soon at a new job. But what I want to tell you is what Jannine did during her recuperation time. Since she is one to always think of others, this incredible woman thought of what happened in July when I lost all my cookbooks in a flood. 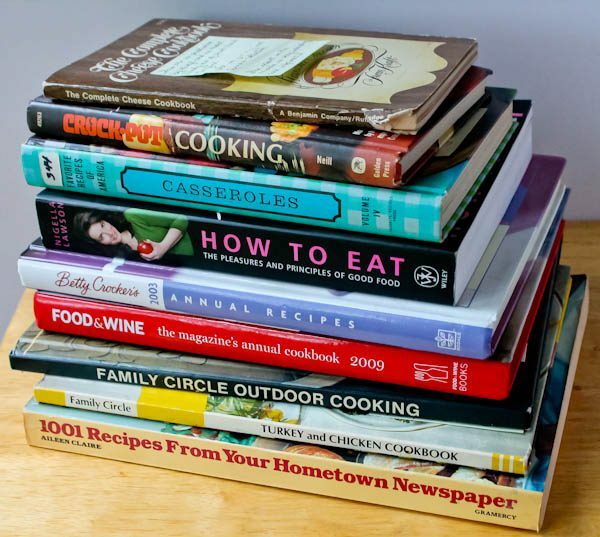 Jannine wanted to help rebuild The Culinary Cellar and sat down to sort through her own cookbooks. She ended up sending eighteen amazing books. Not only that, Jannine made special stickers to put inside each book. The effort, the heart, and the love that went into this brought me to tears. She was facing one of the hardest challenges of her life and still thought to help someone else. Not only did each book have the sticker, Jannine also wrote a little note about every single book. 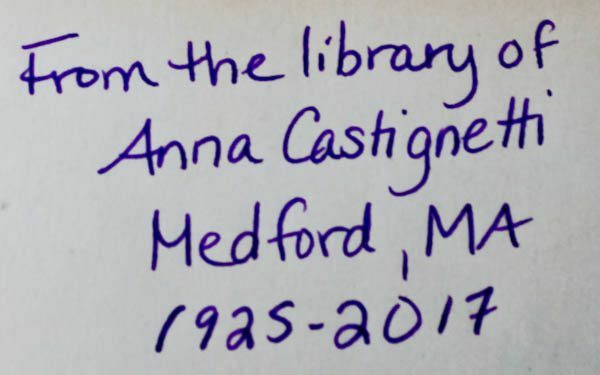 The two books with the notes belonged to Jannine’s beloved Aunt Ann who passed away earlier this year, with her name inside the books. 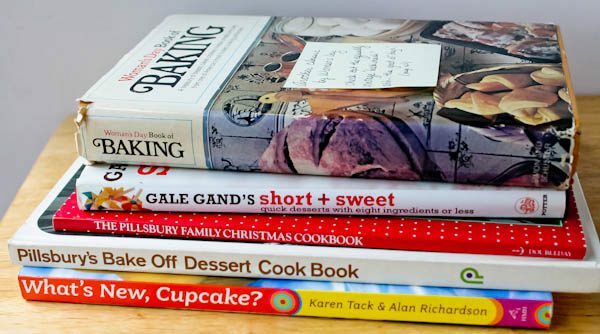 Jannine selected a wide range from cupcakes (to bake with my new granddaughter someday, she said) to the fabulous Gale Gand who happens to live nearby and offers cooking lessons, to some charming vintage books, and of course New England cooking. 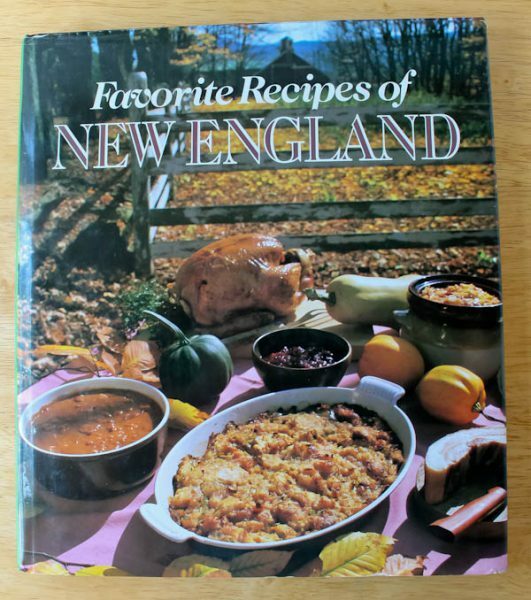 I couldn’t put down a couple of the New England ones, and specifically searched for recipes using maple syrup which my husband loves. I love this cookbook. 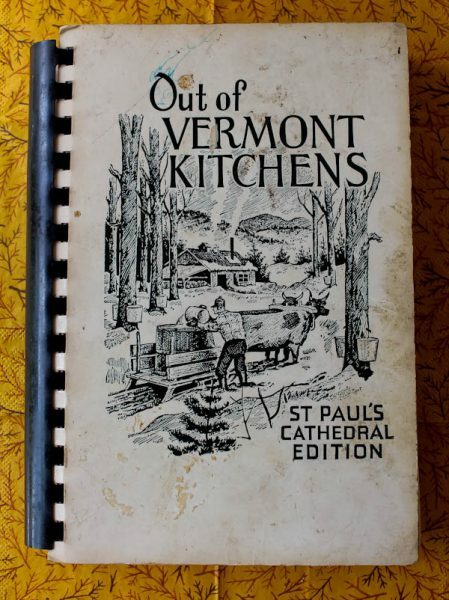 It’s full of charm, great recipes, and whimsical drawings. I was calling out recipe names to my husband across the room and when I said maple fudge in the candy section, his face lit up. 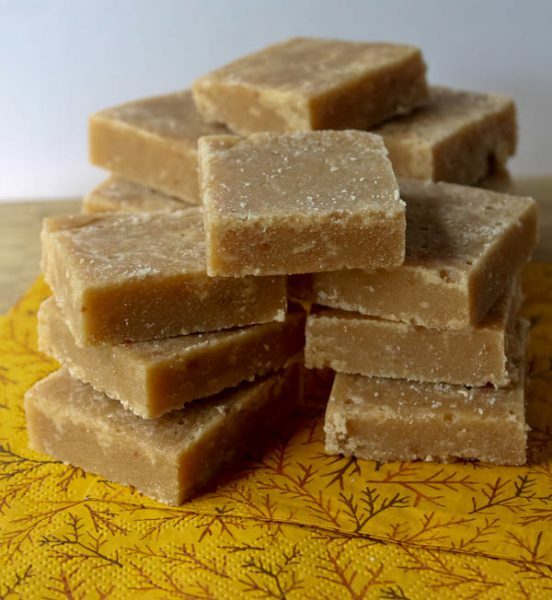 The fudge has a delicate maple flavor and beautiful color. I loved that it was made the really old-fashioned way like my mom used to make. Boiled, then beaten with a wooden spoon until of the right creamy consistency. I told Bill this was lovely but we still needed a dinner. 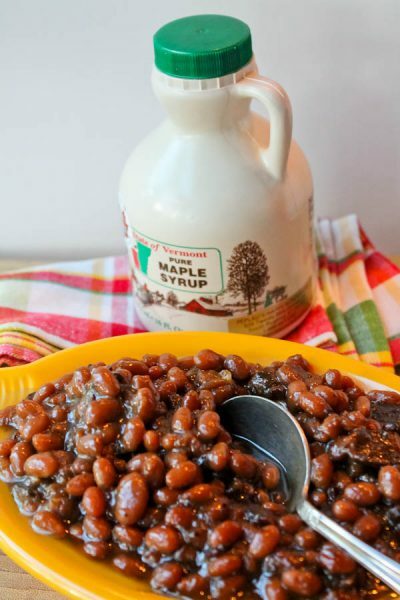 In another New England book, I found a recipe for baked beans that used bourbon along with the maple syrup. That sounded like a dinner made for watching a Bears game, Bill declared, along with smoked sausage and corn-on-the-cob. 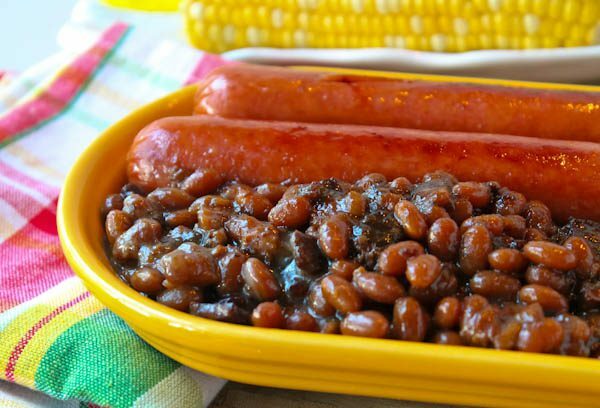 These baked beans are heavenly! I’ll be making them again. I forgot to mention another liquid in the beans – brewed coffee! It truly takes beans to a new height. 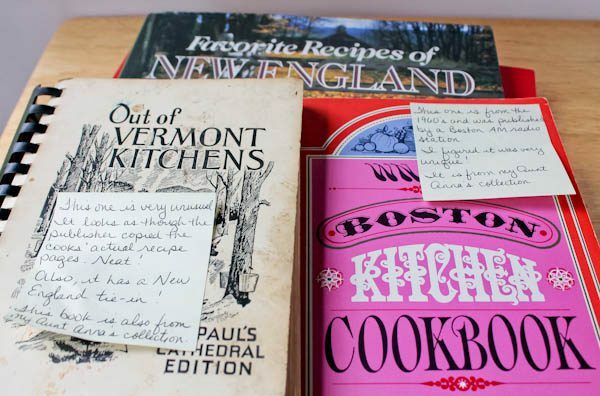 Jannine’s cookbooks are filled with post-it notes of recipes I can’t wait to try. Watch for blogs on some of these other books at a later date. 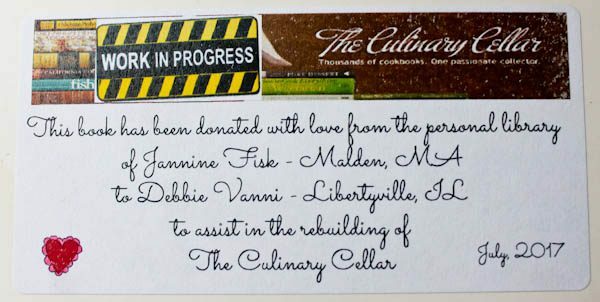 My Culinary Cellar will never forget you, Jannine. Anytime I have a friend come over to look at the books, your sticker in each book will draw a little gasp, then a “Wow,” then a “She must be a special person to do something like this.” I know that’s what will happen because it already has, and almost the same way every time as I described. Books talk, and yours speak volumes of your generosity and spirit. Right from your New England Heart. Soak beans overnight in water to cover. Drain beans and set aside. In a large bowl, combine mustard, pepper, ginger, vinegars, and coffee. Add maple syrup and molasses and mix well. Add the onion and pork. Pour in the bourbon and stir in the beans. Transfer beans to an ovenproof baking dish. Bake for 9 hours in a preheated 250 degree oven, stirring several times in the baking process. If needed, add a little water so beans don't dry out. Serves 8-10. 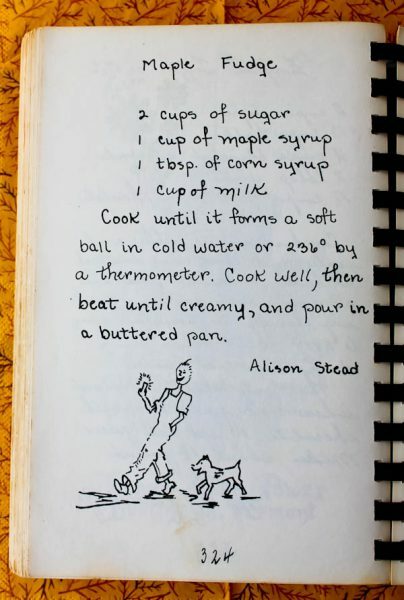 Any recipe is good with maple syrup, right? None of this surprises me because Jannine is such a wonderfully warm woman. What she had been through in the past couple of years is a testament to her incredible spirit. Even though we’ve never met face to face, I count her as a very good friend. Lucky me! We are all lucky to know Jannine! Jannine is truly one of a kind!!!! She is so thoughtful and caring. And I’m happy to call her one of my dearest friends! Thanks for sharing these recipes, Debbie! I think I’ll be making the Maple Fudge this Christmas! I know my family will love it!!!!! I agree, Ronna. Jannine is one of a kind. I hope you like the Maple Fudge! How wonderful! She is VERY special. She truly is amazing. Beautiful heart! What a lovely, thoughtful gesture! Jannine’s selfless generosity is enough to restore my faith in mankind. Enjoy the new books! I’m sure you will find some culinary gems in that treasure trove. Jannine is such a special soul ! This story does not surprise me as even through her struggles, she continues to send sweet Thank You cards and posts precious responses to me and everyone else that holds her near and dear !! A sweeter soul has never lived ! ::snuggles and smooches:: to my East Coast Girlie ! Stay well !! Jannine is truly one of the kindest and most thoughtful people I have ever had the pleasure of knowing. 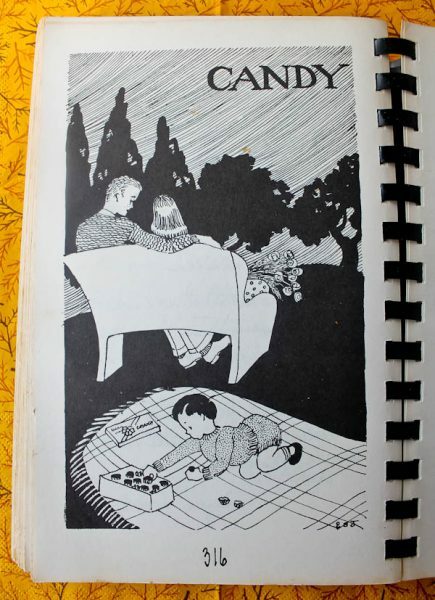 I met her at our local farmers market many years ago when my family became addicted to her & her sister’s wonderful sweet treats— in particular their heavenly Hulabaloo bars. Jannine and my now teenage son have an extra special connection and he considers it a treat— even sweeter than her baking to spend time with her. She models grace and kindness to each of us every day. Thank you for this lovely post & for letting everyone know what a truly special person Jannine is to each one of us that is blessed to know her. Thank you so much for writing, Gwen. Jannine has touched and continues to touch so many hearts. Just as lovely and special as Jannine! Thank you for these recent posts!